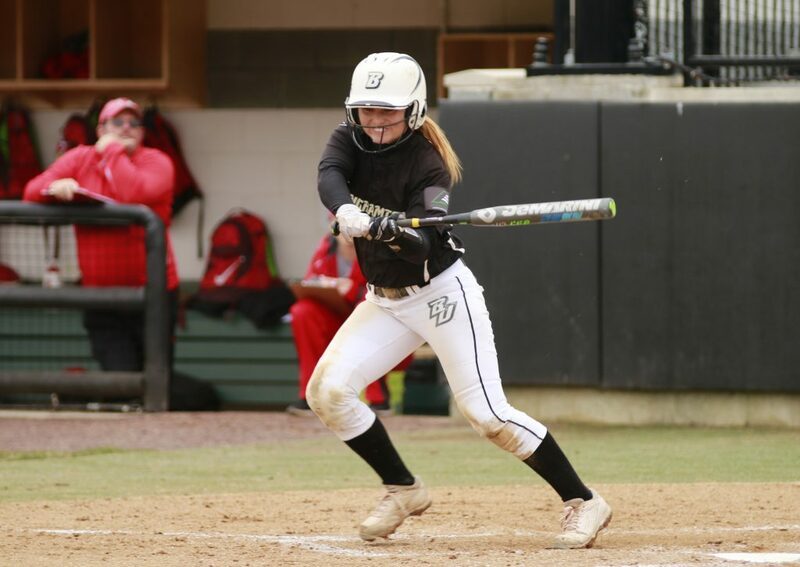 Katherine Scott/Pipe Dream Photographer Senior outfielder Jessica Rutherford enters her final season at Binghamton. As Mets hopeful Tim Tebow fights for a spot in the majors and Yankees outfielders Aaron Judge and Giancarlo Stanton begin to mesh in spring training in the MLB, the Binghamton softball team is ready to start its season. Last season, the Bearcats managed to win the America East regular season title with an impressive 11-4 conference record, despite an overall record of 22-25. After a disappointing loss to Maine in the 2017 America East Tournament, BU is beginning to focus on a fresh slate. Johnston has put an emphasis on using a game-by-game approach instead of clinging to the past or lunging toward the future. Johnston said she is proud of the team’s work ethic. Even with a delayed start to the season, the team has meshed well in practices leading up to its opener. Senior outfielder Jessica Rutherford is looking to continue her notable career in her final season with the Bearcats. Rutherford was named AE Rookie of the Year in 2015 and first-team AE All-Conference multiple times. She had the highest batting average out of all returning players for Binghamton, hitting .358 last season. Sophomore starting pitcher Rayn Gibson is excited to play with hitters like Rutherford behind her. She is comforted knowing that she will always have a hard-hitting offense to back her up. Gibson is one of two starting pitchers who started as freshmen last year. Now, with a new lefty freshman pitcher, Chelsea Howard, joining the rotation, they have a strong new core. Despite being a mix of underclassmen and upperclassmen, the pitchers feel very comfortable as a group. The team is ready to start its season and begin its journey to avenge its AE Tournament defeat. When asked if she has sights on the AE title, Bielec stayed true to the team’s philosophy. The Bearcats are set to start the season in Beaumont, Texas, facing off in the Lamar Cardinal Classic against Alabama A&M University on Friday at 10:30 a.m.